Expression levels of the target protein vary between different tissue/cell lines and in some cases induction may be required before a signal is observed. Recombinant full length protein within Mouse p21 aa 1 to the C-terminus. The exact sequence is proprietary. WB: RAW 264.7 whole cell lysate; NIH/3T3, untreated and treated with 1µM staurosporine for 2hrs, whole cell lysates. IHC-P: Mouse testis and lung tissues. ICC/IF: RAW 264.7 and NIH/3T3 cells. Flow Cyt: RAW 264.7 cells. IP: NIN/3T3 whole cell lysate. Our Abpromise guarantee covers the use of ab188224 in the following tested applications. WB 1/1000. Detects a band of approximately 18 kDa (predicted molecular weight: 18 kDa). IHC-P 1/1000. Perform heat mediated antigen retrieval with Tris/EDTA buffer pH 9.0 before commencing with IHC staining protocol. ab172730-Rabbit monoclonal IgG, is suitable for use as an isotype control with this antibody. Expressed in all adult human tissues, with 5-fold lower levels observed in the brain. The PIP-box K+4 motif mediates both the interaction with PCNA and the recuitment of the DCX(DTL) complex: while the PIP-box interacts with PCNA, the presence of the K+4 submotif, recruits the DCX(DTL) complex, leading to its ubiquitination. The C-terminal is required for nuclear localization of the cyclin D-CDK4 complex. Phosphorylation of Thr-145 by Akt or of Ser-146 by PKC impairs binding to PCNA. Phosphorylation at Ser-114 by GSK3-beta enhances ubiquitination by the DCX(DTL) complex. Ubiquitinated by MKRN1; leading to polyubiquitination and 26S proteasome-dependent degradation. Ubiquitinated by the DCX(DTL) complex, also named CRL4(CDT2) complex, leading to its degradation during S phase or following UV irradiation. Ubiquitination by the DCX(DTL) complex is essential to control replication licensing and is PCNA-dependent: interacts with PCNA via its PIP-box, while the presence of the containing the 'K+4' motif in the PIP box, recruit the DCX(DTL) complex, leading to its degradation. The expression level of p21 protein can be induced using staurosporine (protein kinase C inhibitor) (PMID:7677742). Immunohistochemical analysis of paraffin-embedded mouse testis tissue labeling p21 with ab188224 at 1/1000 dilution, followed by Goat Anti-Rabbit IgG H&L (HRP) (ab97051) at 1/500 dilution. 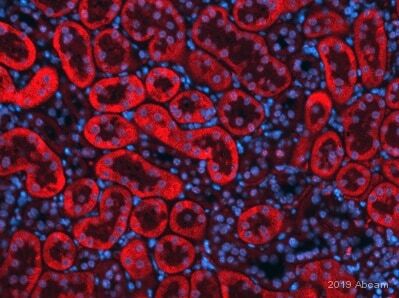 Nuclear staining on mouse testis is observed (PMID: 9170103). Immunofluorescent analysis of 4% paraformaldehyde-fixed, 0.1% Triton X-100 permeabilized RAW 264.7 (Mouse macrophage cell line transformed with Abelson murine leukemia virus) cells labeling p21 with ab188224 at 1/500 dilution, followed by Goat anti-rabbit IgG (Alexa Fluor® 488) (ab150077) secondary antibody at 1/1000 dilution (green). Confocal image showing nuclear staining on RAW264.7 cells. Tubulin is detected with ab195889 (Anti-alpha Tubulin antibody [DM1A] - Microtubule Marker (Alexa Fluor® 594)) at 1/200 dilution (red). Secondary antibody only control: Used PBS instead of primary antibody, secondary antibody is Goat anti-rabbit IgG (Alexa Fluor® 488) (ab150077) at 1/1000 dilution. Immunohistochemical analysis of paraffin-embedded mouse lung tissue labeling p21 with ab188224 at 1/1000 dilution, followed by Goat Anti-Rabbit IgG H&L (HRP) (ab97051) at 1/500 dilution. 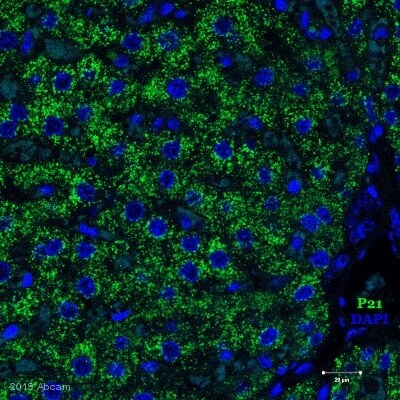 Sporadic nuclear staining on mouse lung is observed (PMID: 25333671). Immunofluorescent analysis of 4% paraformaldehyde-fixed, 0.1% Triton X-100 permeabilized NIH/3T3 (Mouse embryonic fibroblast cell line) cells labeling p21 with ab188224 at 1/500 dilution, followed by Goat anti-rabbit IgG (Alexa Fluor® 488) (ab150077) secondary antibody at 1/1000 dilution (green). 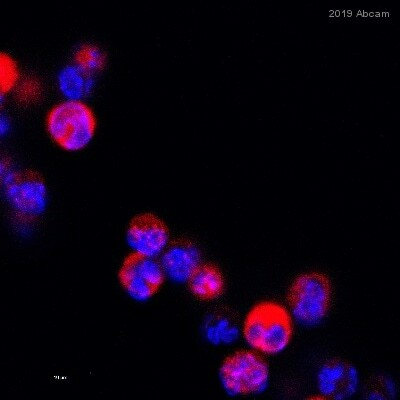 Confocal image showing nuclear staining on NIH/3T3 cells. Flow cytometric analysis of 4% paraformaldehyde-fixed RAW 264.7 (Mouse macrophage cell line transformed with Abelson murine leukemia virus) cells labeling p21 with ab188224 at 1/50 dilution (red) compared with a rabbit monoclonal IgG isotype control (ab172730; black) and an unlabeled control (cells without incubation with primary antibody and secondary antibody; blue). Goat anti rabbit IgG (Alexa Fluor® 488) (ab150077) at 1/2000 dilution was used as the secondary antibody. p21 was immunoprecipitated from 0.35 mg of NIH/3T3 (Mouse embryonic fibroblast cell line) whole cell lysate with ab188224 at 1/30 dilution. 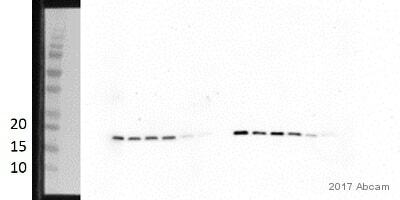 Western blot was performed from the immunoprecipitate using ab188224 at 1/500 dilution. VeriBlot for IP secondary antibody (HRP) (ab131366), was used as secondary antibody at 1/1000 dilution. Lane 1: NIH/3T3 whole cell lysate 10 µg (Input). Lane 2: ab188224 IP in NIH/3T3 whole cell lysate. Lane 3: Rabbit monoclonal IgG (ab172730) instead of ab188224 in NIH/3T3 whole cell lysate. Publishing research using ab188224? Please let us know so that we can cite the reference in this datasheet.